How can you lead as a counselor in a bishopric, quorum presidency, or auxiliary presidency? There doesn't seem to be very much information in Handbook 2 about how to be a counselor. From Handbook 2: section 4.2 "The bishop’s decisions are better informed and implemented when made after discussions with his counselors." Most of the rest of the handbook just lists what the bishop can delegate to his counselors. So, how do we learn to be an excellent counselor? 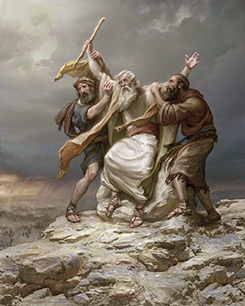 To me, this picture of Aaron and Hur holding up Moses’ hands is representative of what a counselor does. As I think about all the times I have been a counselor I believe there are two parts to this responsibility. One reason wingmen are so valuable is that they see the world from a slightly different perspective. I believe it is the counselor’s responsibility to bring both his unique talents as well as his or her perspective to the presidency. Each of us are blessed with individual talents and spiritual gifts (Moroni 10:8-18). With three sets of spiritual gifts the capability of the presidency is magnified and their unity offers protection.